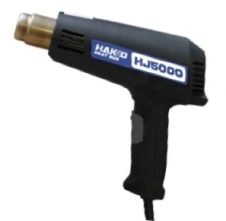 Hakko HJ5000 is a lightweight easy-to-use heat gun providing a quick heat up and quiet operation.  Dual temperature design for intermittent use.  Ideal for heat shrink tubing, curing epoxies and stripping multiple layers of paint.  Dual temperature 600° and 900° settings.  Double insulated UL-listed rubber cord.